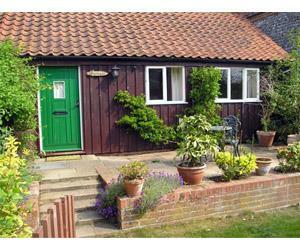 The 3 single-storey, south-facing cottages have been converted from farm buildings. The cottages stand in the country grounds which include an 8-acre woodland in which guests are free to wander. Two of the cottages are semi detached and each sleep two in a double bedroom plus cot. Both have a small garden with patio area. The third cottage sleeps 4/5 in one double and one twin, together with a bed settee in the lounge. A cot can also be provided. The cottage has an enclosed garden with patio area. All cottages are fully equipped, including microwaves, electric cookers & TV/Video. Bed linen and towels are provided. From M11 Located on the A149 Great Yarmouth to Cromer Road on the outskirts of Thorpe Market village approximately 5miles south of Cromer. From Gunton Bus service from Norwich via North Walsham or Cromer.